Fraternidad Cristiana, was born in the heart of Pastor Jorge H. Lopez long before it existed in reality, since his teens years, he gave his life to serving God and at age 15 he entered Bible school. However, his vision was always to start a new congregation in the city of Guatemala, a congregation that could break with all the traditional patterns. A Church that could leave in oblivion the mentality, that a Christian should be poor, uneducated and without any influence in society. It would be self- financed by its members without foreign assistance, its leadership would be made only by nationals and never would borrow nor owe anything to anyone. 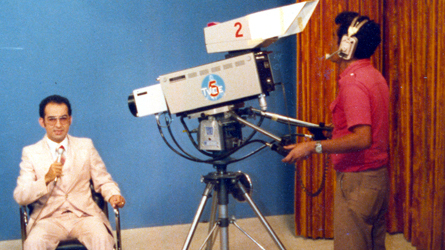 In 1978, he introduced the project to the ministerial body of the churches of El Calvario, with whom he had been working. They sent a letter in which they stated, they believed his vision was God’s will and that this new congregation would be outside the structure of the Calvary Churches, to avoid conflicts, as he had requested. The months of November and December 1978 were devoted to make campaign within the congregation so that nobody would leave the church and go with him, (this is an interesting fact, since the majority of pastors today when they begin a congregation can take months to make campaign to steal members from where they are leaving, showing no ministerial ethics, or a vision, but pure ambition). 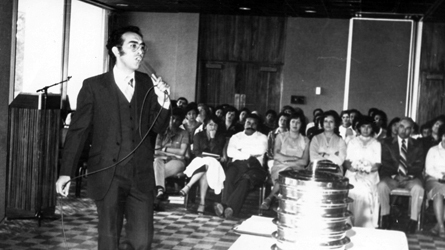 On November 29, 1978, Pastor Jorge in his 28 years of age, with around 22 people, wrote up the Articles of Association of this congregation. Fraternidad Cristiana would become a congregation where there would be love, power and order, three key words that are part of its logo, representing that way what has always characterized this congregation, “A Christian Church for the Family, which proclaims the love of God, manifests the power of the risen Christ and perseveres in the order given in the Bible.” This church was started as a rotating cell group, with other people, mostly women who were Christians but did not attend any church, who made a pledge of faith to give a certain amount of money each month during a year, for the support of the work of God. Christian Fraternity began its meetings on January 7, 1979 in Guatemala Fiesta Hotel (now Holiday Inn) where it remained for three years. Due to the numerical growth, it was transferred to the Camino Real Hotel and seven months after the movie theater of Reforma Cinema was rented where they met for two years and a half. Frater has grown from 20 to more than 15,000 people, who after many years of meeting in various rented places, now they own everything and without borrowing or owing anything to anyone, a policy that Pastor Jorge has followed from its beginnings. In 1985, Frater bought a piece of land of more than 13,977 square meters, along one of the main roads that has become one of the largest in Guatemala, Calzada Roosevelt, which is part of the Panamerican Highway. On February 10, 1985, with a caravan of over 300 cars leaving Cine Reforma, the whole congregation went out to Calzada Roosevelt where the new land with a concrete building, which was remodeled up to 750 people, was pre-opened. It formally opened a week later. In October 1986, Frater bought a land annex that had a galley and a main house, widening the land size to 20,966 square meters. 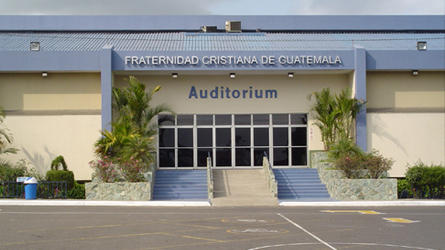 In February 1991, Guatemala’s largest auditorium was opened with capacity for 3,500 people comfortably seated, with a building with four floors to be used for the Christian Fraternity Bilingual School (Liceo Bilingue Fraternidad Cristiana) and Champions Zone (Sunday School). To be faithful to Pastor´s firm conviction of never to owe anything to anyone, everything was paid in cash by tithes, offerings and pledges of faith given by the whole congregation. The opening day people did not fit in the Main Auditorium or the Minor Auditorium, where it was installed a closed circuit television. Because of the number of people, two services were started on Sundays, one at 8:00 am and the other at 10:30 a.m. The church continued to grow so that there were held three services, the first at 7:00 am, the second at 9:30 and the third at 12:00 pm. The day when the Main Auditorium was inaugurated, Pastor Jorge surprised the congregation by announcing that all living things must grow and therefore, we should continue to grow and that our next goal would be to build a new auditorium with capacity for 12,000. 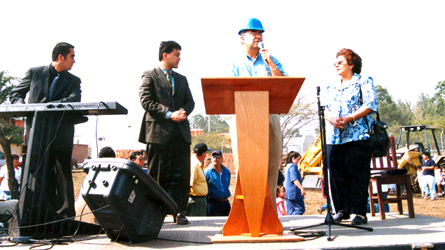 Pastor Jorge began to look for another location for the new auditorium and after several months, a land of 7.51 hectares was bought in Ciudad San Cristobal, Mixco, an ever-progressing housing, social, economic and commercial sector, where with the help of God the new auditorium was built. In March 2001 construction began on the largest construction project in Guatemala, Mega Frater project is located at the entrance of Ciudad San Cristobal. It features an auditorium for 12, 200 comfortably seated people, a parking space for 2,531 vehicles and several buildings to cover all current and future needs. Ten buildings in total. Simultaneous Interpretation Ministry, which brings Spanish to English Interpretation to all our visitors who come from United States of American and other English speaking countries. 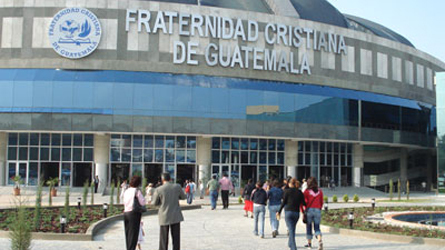 Christian Fraternity is an active member of Channel 21- Enlace Guatemala. Santiago, Atitlán, Sololá, Guatemala among the Tzutuhil Mayan Indians. Santa Ana, El Salvador, Central América.